On June 22, 2010, the U.S. 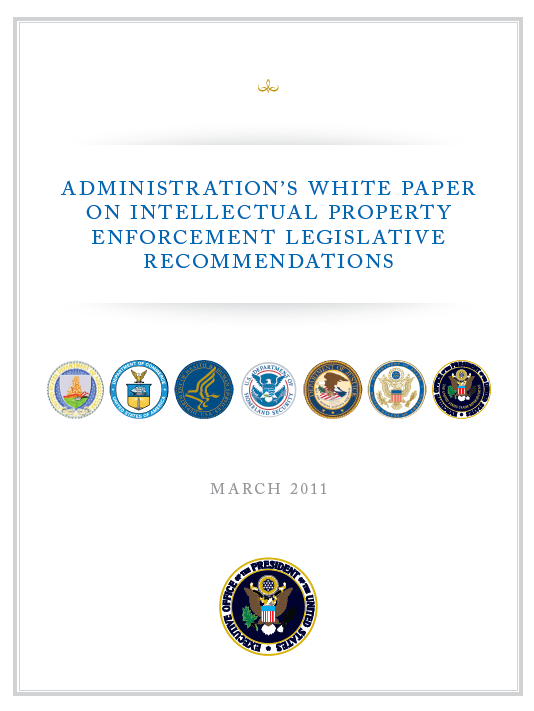 Intellectual Property Enforcement Coordinator (IPEC) issued the Administration’s first Joint Strategic Plan on Intellectual Property Enforcement (Strategy), which was developed in coordination with many Federal agencies, including the Departments of Commerce, Health and Human Services, Homeland Security (DHS), Justice (DOJ), and State, and the U.S. Trade Representative. As part of the Strategy, the Administration undertook to review existing laws to ensure that they were effective and to identify deficiencies that could hinder enforcement. Based on that review, this White Paper identifies specific recommended legislative changes, designed to increase the effectiveness of U.S. enforcement efforts. We will, of course, continue to assess existing legislation and recommend any further changes to the law as the need arises. Piracy and counterfeiting in the online environment are significant concerns for the Administration. They cause economic harm and threaten the health and safety of American consumers. Foreign-based and foreign-controlled websites and web services raise particular concerns for U.S. enforcement efforts. We are aware that members of Congress share our goal of reducing online infringement and are considering measures to increase law enforcement authority to combat websites that are used to distribute or provide access to infringing products. We look forward to working with Congress on those efforts and the recommendations contained in this paper in the coming year. 3. Give law enforcement authority to seek a wiretap for criminal copyright and trademark offenses. 2. Give DHS authority to share information about, and samples of, circumvention devices with rightholders post-seizure. Increase in the Offense Level for Theft of Trade Secrets and Economic Espionage: There is currently a two-level enhancement for economic espionage: “If the offense involved misappropriation of a trade secret and the defendant knew or intended that the offense would benefit a foreign government, foreign instrumentality, or foreign agent, increase by 2 levels.” USSG § 2B1.1(b)(5). The Administration recommends that Congress adopt legislation requiring the U.S. Sentencing Commission to consider three changes to this Guideline. First, the two-level enhancement should apply to the simple misappropriation of a trade secret (the Guideline at issue is a general fraud Guideline and does not otherwise account for the theft of trade secrets). Second, an additional two-level enhancement should apply if the defendant transmits or attempts to transmit the stolen trade secret outside of the U.S., or an additional three-level enhancement should apply if the defendant instead commits economic espionage, i.e., he/she knew or intended that the offense would benefit a foreign government, foreign instrumentality, or foreign agent. Third, when a defendant transmits trade secrets outside of the U.S. or commits economic espionage, that defendant should face a minimum offense level.